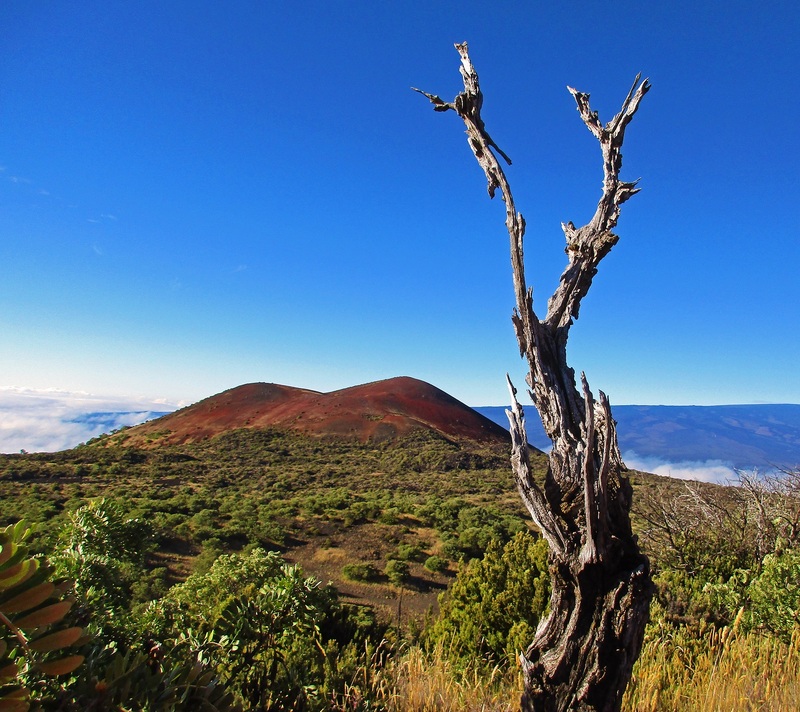 It's called Pu'u Kale, which translates to 'Red Hill'. 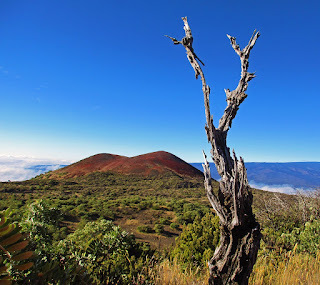 It rests on the slopes of Mauna Kea, and its summit is just under 9000 feet elevation. 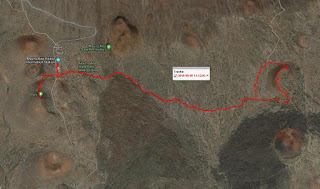 Today I hiked there and climbed an adjacent cinder cone with no name that I know of, so I called it 'My Hill'. Red Hill is a sight to be seen more than a summit to bag. 'My hill' is, in my opinion, the summit to explore in person because it's not just a lot of loose barren gravel. 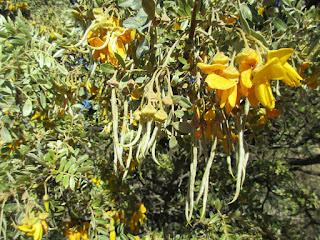 It is populated by some fantastic specimens of the endemic Mamane tree, a member of the pea family. Here's the most venerable old denizen that I found. Trees with character are one of my favorite photographic subjects. Trees that endure the harsh, dry climate and thin rocky soil here can hardly help but develop character. Even after they've long since passed away. Weather had been bad for a day with what's called a Tropical Easterly Wave rolling through. Down in Hilo it rained heavily for fifteen minutes every hour and a half for most of two days. Even up here at 9000 feet it was cloudy and there were showers yesterday. But today the system had moved on and the sun rose stark and bright above the cloud tops at about 7300 feet. 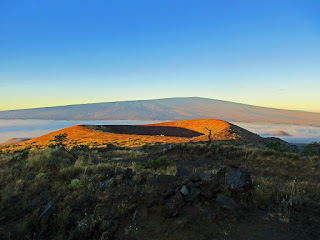 Here's an early morning view of another cinder cone at about 7800 feet, seen on my drive up. 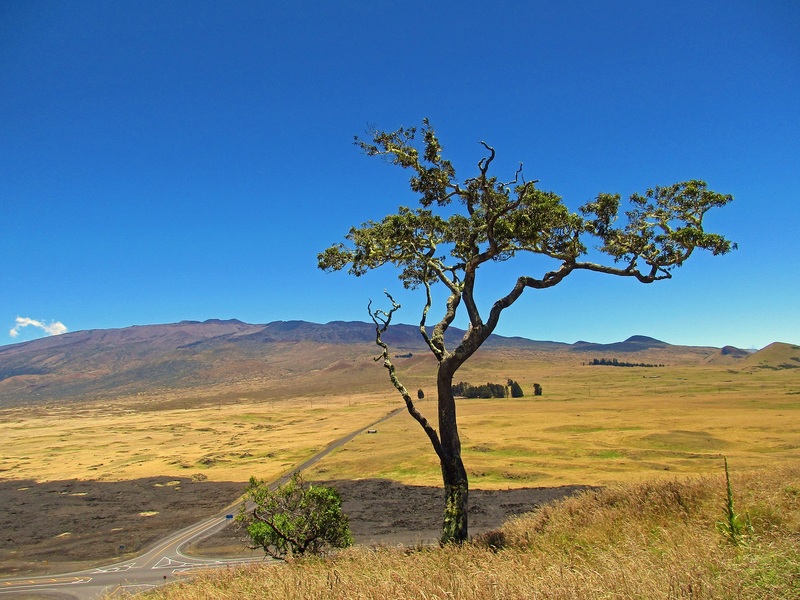 After climbing 'My Hill' I stopped in at the Mauna Kea Visitor Information Center and then took a short walk to the summit of another cinder cone called Pu'u Kalepeamoa. 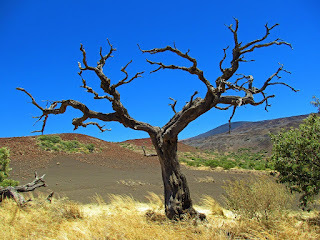 Great views of Mauna Loa and the Saddle area from there, and along the trail I found another example of the beauty that death bestows on the Mamane tree. Feral goats and sheep have degraded the Mamane forests since Europeans introduced them here. 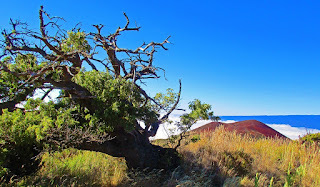 Whether they can be blamed for the demise of this particular tree is beyond knowing, but what I can do is demonstrate how these trees work to sustain a healthy ecosystem. 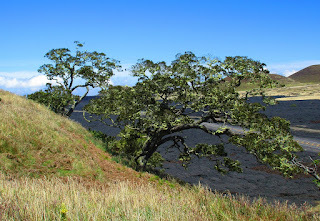 Here's a track of the Red Hill/My Hill and Pu'u Kalepeamoa hike. The color of Red Hill is clearly most intense on the north facing side, which is the view I had. 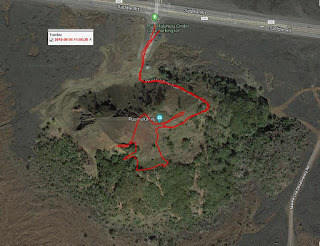 To cap off the day I headed back down to the Saddle Road and visited a tiny woodland reserve on another cinder cone that has been isolated from the surroundings by a recent lava flow. 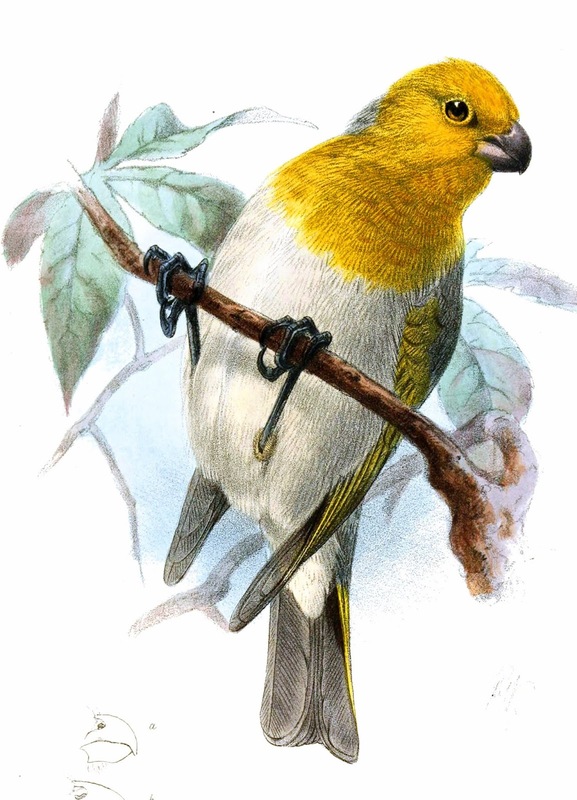 This is Pu'u Huluhulu. 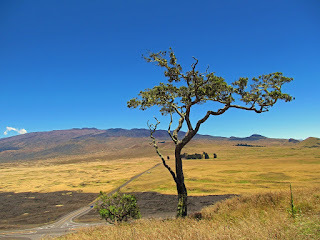 It's like a little mountain wedged perfectly into the gap between the Big Island's two giants, Mauna Loa and Mauna Kea. 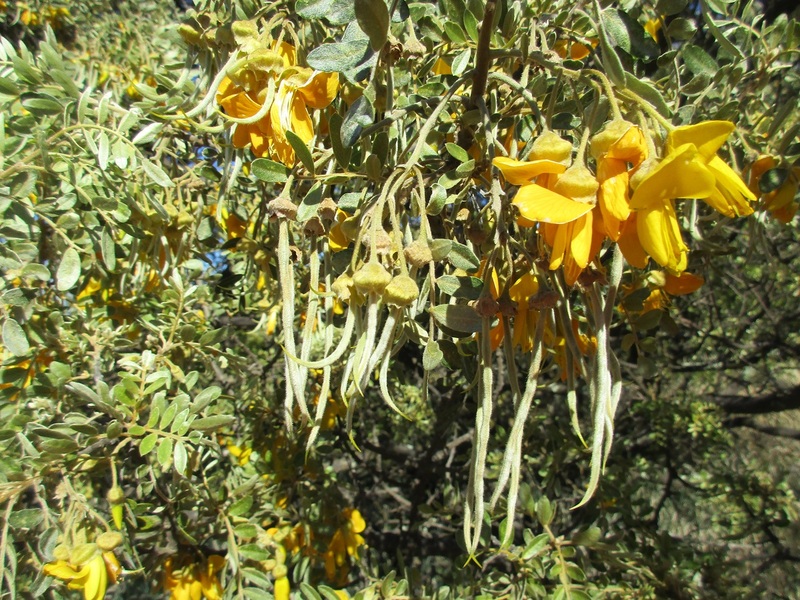 It's just 6600 feet at its summit and the trees here are not the Mamane, but unfortunately I have no identification for these photogenic specimens. 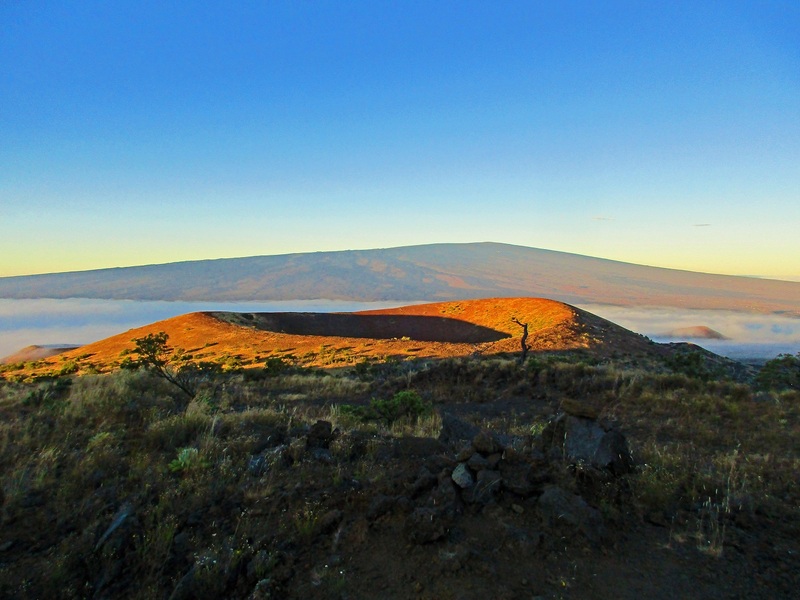 Looking west toward the Kona coast from the top of Pu'u Huluhulu. The recent lava flow that surrounds this forest enclave is clearly visible below. These were the hikes I chose today. I generally don't make final decisions about where to go until the morning. So watch this space to see what's next.